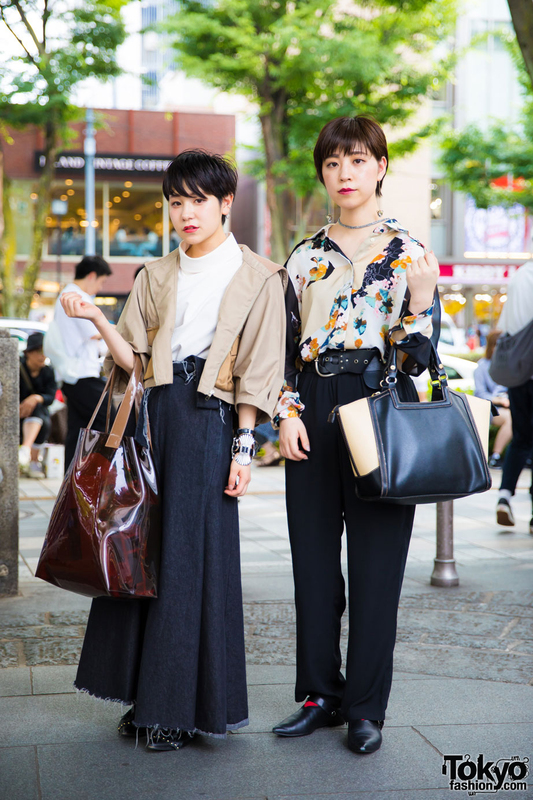 Stylish Harajuku girls in chic ensembles wearing a cropped jacket over cowl neck top, maxi denim skirt, pointy heels, floral print top, black pants, see-through bag, colorblock handbag, and accessories. Harajuku duo in minimalist fashion with sweater and leather skirt, button down shirt and coat, black pants, cheetah print creepers and leather boots. Harajuku girl with pink hair wearing a vintage sheer nightgown over a turtleneck and mini skirt with Alice in Wonderland bag and rocking horse shoes. 23-year-old Japanese girl with red hair wearing a denim vest over a long flower dress from Rodeo Crowns in Harajuku.